All drumsticks and guitar picks eventually wear out. It's just in their nature. Subscription plans are the best way to get new sticks and picks delivered right to your door every month. There are a variety of plans available, so you select the plan that is perfect for you and MRB will do the rest. You can cancel or skip a month any time. When do you bill me for my plan? All existing subscription plans are automatically re-billed on the 15th of each month. New orders received before the 5th of the month are billed immediately. Orders placed on or after the 5th, will skip that months renewal, and be billed on the 15th of the next month, to avoid being double billed in the same month. Changes made to your plan must be made by the end of the day on the 14th of each month in order to be recognized for that months shipment. When do you ship me my favorite new stuff? Existing plans will be shipped by the 19th of each month, or the next business day. New orders placed on or after the 5th, will ship immediately, but skip that months renewal, and ship 19th of the next month, to avoid receiving 2 shipments in the same month. Changes made to your plan must be made by end of the day on the 14th of each month in order to be recognized for that months shipment. 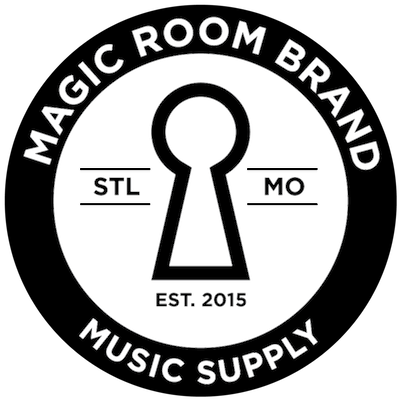 Magic Room Brand is custom-made gear, so you're getting premium accessories that are designed, crafted, and tested with the same care you put in your music. Your MRB picks and sticks come in a reusable bamboo fiber drawstring bag. Let us know how you're reusing those! And of course, every delivery includes a rad MRB sticker - perfect for your vehicle, your guitar case, or to hold up the "kick me" sign on your lead singer's back. Good for you. You've earned it. You can simply skip a month on your plan at any time without canceling. If you pause after your payment has been processed, but before we ship, then we will skip the following month's shipment. Skip a month at your customer account page. Also, bring me back something nice? You can change your shipping address or billing information at anytime in your customer account page. Can I cancel or change my subscription plan? Yep. You can change plans, upgrade, or adjust product sections, at any time from your customer account page. You can also skip a month or do an every-other-month plan, if you want. To unsubscribe or permanently change the frequency of your plan, just shoot a message at whatsup@magicroombrand.com . If you do decide to leave, you can reactivate at anytime and pick up where you left off. No, those arent' tears, there's just a lot of dust in here, ok? If you need some help with your account, shoot an e-mail at whatsup@magicroombrand.com . Can I try out a pair of sticks or some picks before subscribing? Yep. You can cancel or change your plan at anytime. Or, you can grab some gear in our online store with no monthly subscription needed. Free shipping for single orders over $75. I need more picks or sticks every month. Can you make this happen? If you need more sticks or picks per month than our plans currently offer, we can of course set that up. Please send a note to whatsup@magicroombrand.com . If you need less than one pair of sticks or 5 picks a month, you can either do an every-other-month plan, "skip a month" on your monthly plan, or go to the online store for one-off purchases as you need. How long to drumsticks and/or guitar picks normally last? Hmmm...it depends. How often you play, your style, etc., are all factors. That said, MRB gear is meant to sound better while lasting longer. If you're a casual basement drummer, a pair oughta last 4-6 weeks, if not longer (again, based on frequency, style, and technique). If you're gigging/touring with a band, then you'll go through them faster as you're playing more often. It's our experience that a new fresh set of sticks is a good idea if you have a studio session or show coming up, just to ensure response, balance, and tone. Even if they're not "broken," all sticks wear out and lose some balance and response. For picks, again, it's a good idea to have a fresh set for an upcoming show or studio session. Five picks every 4-8 weeks should do you good, but let's be honest, it depends on how often you lose them. What are MRB guitar picks made out of? "The Signature" Magic Room Brand guitar picks are made of bamboo cellulose (from inside the bamboo stalk), other natural plant fibers, and water. That's it. Seriously. Compressed at high temperatures to ensure strength and playability. MRB also offers guitar picks in different sizes (standard, standard with thumb grip, standard with thumb grip & finger notch, jazz, and "fatty" for bass) that are made of the outer stalk of bamboo grass. Dried to ensure strength and durability. All-natural surface improves grip with use. What are MRB drumsticks made out of? Dreams. They're made of dreams. For real though, MRB drumsticks are made of 100% bamboo grass, resulting in sticks that are lighter than maple, more versatile than hickory, and stronger than oak. We don't use any "hardening" or protective chemical lacquers because bamboo doesn't need it. This results in a grip that gets better with use, and ensures optimal biodegradability when it's all said and done. All MRB gear is designed, developed, and reviewed right here in Saint Louis, Missouri USA. MRB partners with expert bamboo craftsmen in the Jiangsu region of China - home to the best bamboo in the world - to ensure every item is up to snuff for tone, feel, and strength. What is bamboo all about? Where do we start? Bamboo is kind of badass. Let's start there. - Bamboo is a grass - not a wood - so NO deforestation. - Bamboo emits 30-40% more oxygen than trees do...so that's pretty cool. Take a breath. You're welcome. a few days) and requires very little water and no pesticides to grow. - Bamboo actually rejuvenates land so the more you use, the more it grows, and the more it nurtures the soil. - It's naturally moisture-wicking, so our gear gets better with use. - It's more biodegradable than wood (we don't use complex lacquers), and of course more biodegradable than plastic because duh. Are MRB drumsticks and guitar picks really 100% biodegradable? Even if you're one of those people that don't care about the Earth (you monster! ), MRB picks and sticks sound better and last longer. To where does MRB ship? Right now, only within the continental USA. MRB wants to ship everywhere...so stay tuned. When will I get my new favorite stuff? Orders usually arrive 4-6 business days after shipping date. New orders are shipped right away (same or next business day) while all plans ship on the 19th, or the next business day. Plan orders placed on or after the 5th of each month will renew and ship the following month. I haven't received my shipment. What's up? Drag. Orders usually take 4-6 business days to get to you. If it's been longer than that, send a note to whatsup@magicroombrand.com . Someone will get you tracking, order status, and other important information. Most businesses offer "free" shipping but that cost is usually buried in the product price, so not really free. Not cool. You're not a dummy, or else you wouldn't be here. Instead, let's just all be transparent about it. You'll see the product price and the cost of shipping separated so you know what's up and where every hard-earned dollar is going. That said, there's free shipping on all orders over $75. Cool? Cool. I'm super nice. Can I send a gift to someone? Wow. You ARE super nice. Let's be pals. Yes you can send a gift here. Yes. They are available in $25, $50, $75, and $100 amounts and can be found here. It's a bit tricky changing or canceling an order once payment has been processed and/or things are in route. But if that's the case, let's give it the ol' college try and see what can be done. Please shoot us a note at whatsup@magicroombrand.com . If for whatever reason you're not totally happy, send a message. You can return all items and packaging in it's original, unused condition within 14 days of purchase for a full refund. Or you can e-mail us at whatsup@magicroombrand.com if you have any questions. Do you have an artist program for active musicians? It's in development. If you're interested, please go to our Artist Inquiry page and answer a few questions. We'll get back to you within a week or two. How can I know about upcoming contests, new products, and announcements? So glad you asked. Sign up for the MRB Newsleter. so you can be in the know. There's always have something brewing. You can always shoot a note, too, at whatsup@magicroombrand.com. Yes! You can earn rewards for each friend you get to sign up for a new subscription plan. Track your progress, and find your unique referral link to share on your customer account page. If you need any help with any of this, please contact whatsup@magicroombrand.com.